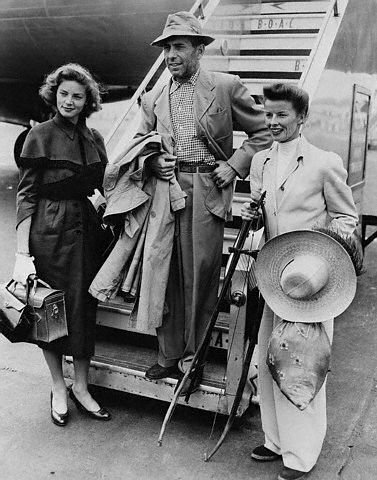 Lauren Bacall, Humphrey Bogart & Katharine Hepburn. Lauren Bacall, Bogart & Katharine Hepburn to begin making The African Queen. Wallpaper and background images in the Classic Movies club. This Classic Movies photo contains boater, leghorn, panama, panama hat, sailor, skimmer, straw hat, fedora, felt hat, homburg, stetson, trilby, and sombrero. There might also be campaign hat, porkpie, porkpie hat, and snap brim hat.